Local people are being urged to put their best foot forward and get in the festive spirit for Renfrewshire’s annual tinsel walk. 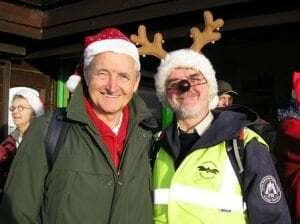 The walk will jingle all the way around the outskirts of Lochwinnoch on Wednesday 12 December at 11am. It’s suited to everyone and while there may be a few small inclines – walkers can go at their own pace. Don’t forget to bring some tinsel and your singing voices to enjoy some carols as you go. Councillor Iain McMillan, Convener of Renfrewshire Council’s Community and Family Care Policy Board, said: “The annual tinsel walk is a wonderful opportunity for local people to get into the festive spirit while getting active at the same time. “Walking is an excellent form of exercise and gives you the chance to socialise too, so don your walking shoes and head along. The walk will meet at Castle Semple Visitor Centre, Lochwinnoch at 11am on Wednesday 12 December. Further information is available from Senga McLeod, walking development officer at senga.mcleod@renfrewshire.gov.uk or on 0141 842 3000.